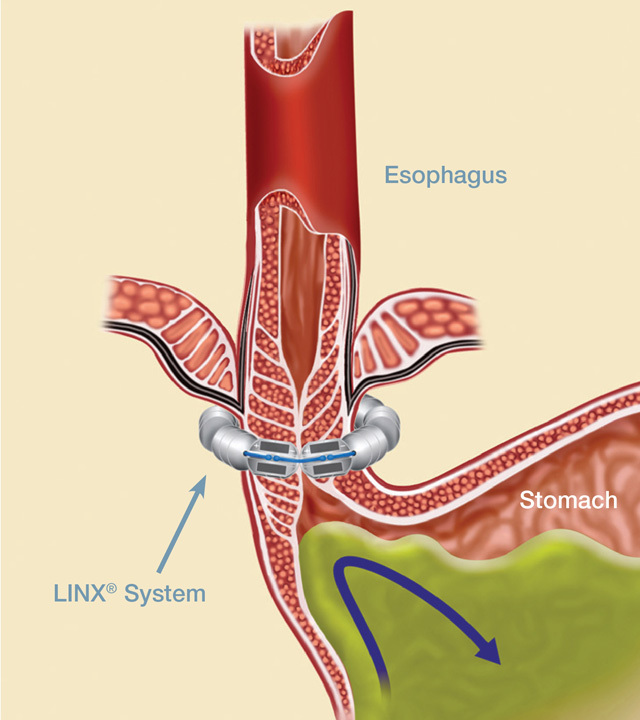 Laparoscopic magnetic sphincter augmentation (LINX) involves implanting a small device (LINX) to tighten the opening of the lower esophageal sphincter (LES) and stop reflux while allowing the patient to eat normally. The LINX is a small implant comprised of interlinked titanium beads with magnetic cores. The magnetic attraction between the beads augments the existing esophageal sphincter’s barrier function to prevent reflux (see figure below). The LINX system is designed for those people with persistent gastroesophageal reflux disease (GERD) who are not successfully treated with antacid medications. What kind of results do you expect from having the LINX device inserted? Our group participated in the multicenter trial published in the New England Journal of Medicine leading to FDA approval in 2012. The results were excellent with complete resolution of regurgitation, and 92% symptom improvement overall. Less than 10% of patients continued to take daily medication. Patients are able to return to normal activities almost immediately and post-surgery patient satisfaction levels are very high. What sort of complications can arise from implantation? No matter how you augment the reflux barrier; you’re going to get some temporary dysphagia. This usually peaks 4-6 weeks after LINX implantation when the scar formation is at its strongest. The scar softens and the dysphagia resolves for nearly all patients by 3 months. Yes, the device can be removed. It usually removed due to dysphagia.